What is the Minimum size of a Bathroom? Does you current room meet ADA and building codes requirements? Are you building a new Bathroom and unsure of the correct size? Clearance and maneuverability is the driving factor to the size of a Bathroom. In a large building, may not big a big concern, as the percentage of area is minimal. When designing for a small commercial office or retail space, a Bathroom can take up valuable real estate. As an Architect, I interact with clients, engineers and contractors who have acquired bits of information about Building Codes. Sometimes, those bits are misconceptions and regurgitated information. The building codes can be intimidating and have no beginning or end. To learn the code, the best way is jumping in feet first. In the next series of blog posts, I will explore common Building Codes. Each City has adopted a code but most in Arizona use the IBC (International Building Code). Door swing direction. Which way should the door swing, out of a room or in? Number of exits within a room? Exit corridor width. How narrow can a hallway be? Clearances around a door? Door arrangement between two doors. Door fire ratings. What is the rating? Should my door have panic hardware? Minimum size of a Bathroom? Small commercial space, is one bathroom enough? The item in bold are addressed in this post. As an Arizona Architect, most City’s jurisdictions work with the IBC (International Building Code). This code analysis is based upon the IBC. When designing a building, creating an efficient plan is important. Having a little extra space in an office, conference room or lobby is not a big problem. Who wants to have wasted space in a Bathroom? It really becomes critical when designing smaller spaces. In retail or office spaces ranging from a few thousand square feet, a Bathroom can take up valuable real estate. 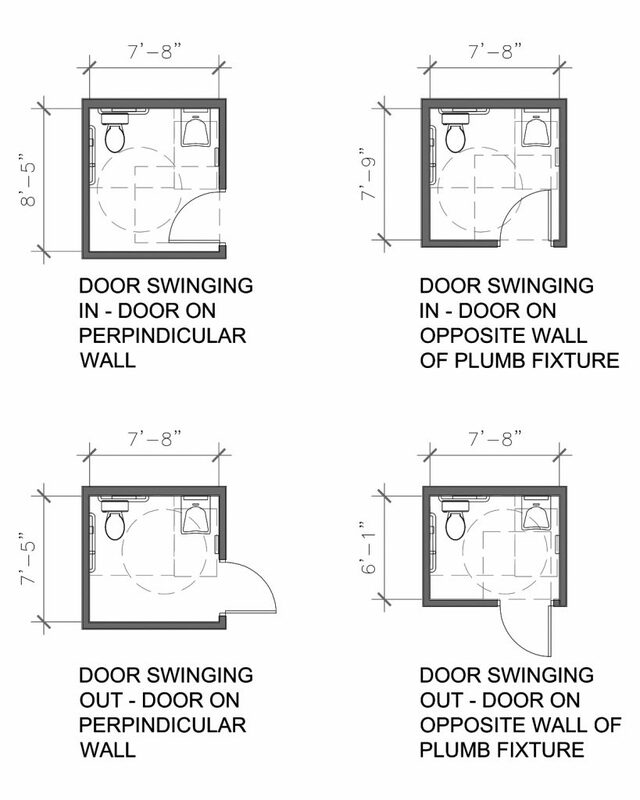 Size of a Bathroom depends on orientation of the fixtures and the swing of the door, swing meaning into the room or out. See “door swing direction” blog for more information. Sink clearance – 30″ wide x 48″ deep (shown dashed on floor plans below). Note – Knee clearance can extend under a sink 25″ maximum, assuming you have a wall hung sink. Rule # 2 – Required clear floor spaces, clearance at plumbing fixtures and turning space shall be permitted to overlap. Turning space – 60″ diameter circle within rest room. Graphic examples of typical Bathroom with one toilet in varying configurations. Note that in all examples, door swing does not encroach on plumbing fixture clearances. When swinging the door out of the room, it is possible to make the room the the smallest. I typically like to make the room just a tad bit larger than required by 1″ – 2″ to take into account construction tolerances and to make sure thickness of materials (ie. tile) or other unforeseen items don’t create a conflict. When creating a new single person Bathroom, make it as efficient in size. Not only are you saving space in a building, it is more cost effective use of building materials. The ADA is a driving factor for the minimum size of a Bathroom. Plumbing fixture clearances are designed so occupants can easily use the restroom whether able bodies or in a wheelchair. Follow the examples above for reference but as always, refer to the local jurisdiction, the current ADA guidelines and a local professional to ensure your projects success.